Shamirpet Lake: April 5th on Royal Enfield One Ride, Hyderabad – Another Saturday night spins off , but this time enriching the wanderlust coefficient of my inner self for it was my first time when I was going on a ride to Shamirpet Lake with a group of Royal Enfield motorcycles. Earlier trips, albeit long, did not give such a feeling of a machine pestering your soul to wander more, arousing that part of your fluid which revives in you the feeling that riding an RE Continental GT (which I call“The Beast), is more than mere motorcycling, its a symbol of brotherhood and discipline. 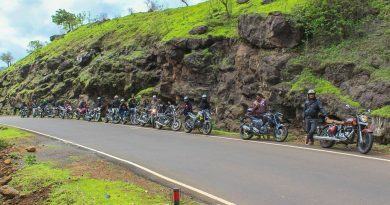 This ride was a part of Royal Enfield One Ride, which is held worldwide on the first Sunday of April every year. I joined this amazing extravagantly energized excursion from Hyderabad. Our ride started from Necklace Road to Shamirpet Lake (around 60 kms) ride in this scorching heat and adverse terrains, and around 200 people with bikes showed up. The best part of such a sporting event was that you synchronize with people around you, who resonate with you and share the vibes. The engine started right from 4 a.m in the morning and came to halt at around 1 pm. Amidst these odd hours, provoking the self dormant nature fed me with such wealth which I would preserve till my last breath. People generally carry a prejudice towards biking ( even I followed the same), however I saw group rides follow a discipline of its own kind. The biker group formations are amazing and hundreds of bikes when roaring and joining in the symphony, moment itself enchants scripts of bliss. Apart from fun and thrill, there are other measures as well which bring us all together, the measure of togetherness and contribution to the society. 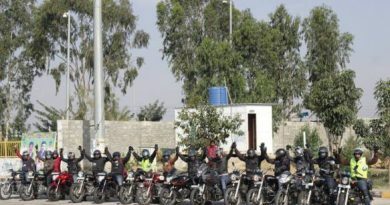 In the ride group itself we had some nuclear groups who worked for raising funds for a cause. We sat down and exchanged some things about ourselves which enlightened me about those who work for a cause and are never part of the spotlight. At the breakfast session near Shamirpet Lake , I came to know about HUB ( Hyderabad United Bikers) group, which helps some schools that have a lack of funds. I came to know about Road Thrill group which combines amazing two wheel machine loving people who love to roam and spread awareness around. Finally I met people from Wanderers as well, who work great for causes like poverty, women empowerment and equality. 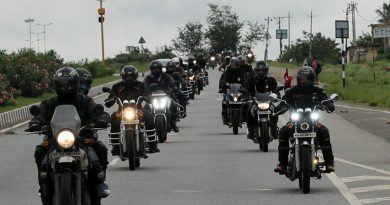 We had some people with us who came all way from different parts of country just to participate in the ride!! Amazing it is how the wanderlust factor enthralls your soul and makes you do things probably which defines thrill. The world today has grown into a large platform where everyone should get a chance, contrary to that yet we come across disturbing scenarios which kind of devastates the basic existence of humanity. I today being a honest citizen and a mature literate might stand with the idea but have never got chance to work for the same. Seeing these small ventures it motivates you to make such one small difference and stamp your existence to humanity, for all we are a mere reflections to the future, and don’t we all want a better future? Guest post by Rishav Sharma from #RTHyderabad.